Katherine Shaver of The Washington Post just wrote about the Pike District, suburban urbanism, and mixed-use developments in a must-read article. The first part is below. Visit The Washington Post to read the entire article. Over the next few decades, Strathmore Square at Grosvenor-Strathmore metro will include seven or more buildings, transforming the current asphalt parking lot into a walkable and distinctive community. Fivesquares Development is submitting an application for initial approval from the Planning Board. Last week, the County Council Planning, Housing and Economic Development Committee (PHED Committee) voted unanimously to approve the Grosvenor/Strathmore Minor Master Plan Amendment. The next step is for the full Council to take up the issue in December. You can learn more about Strathmore Square’s plans on their website. 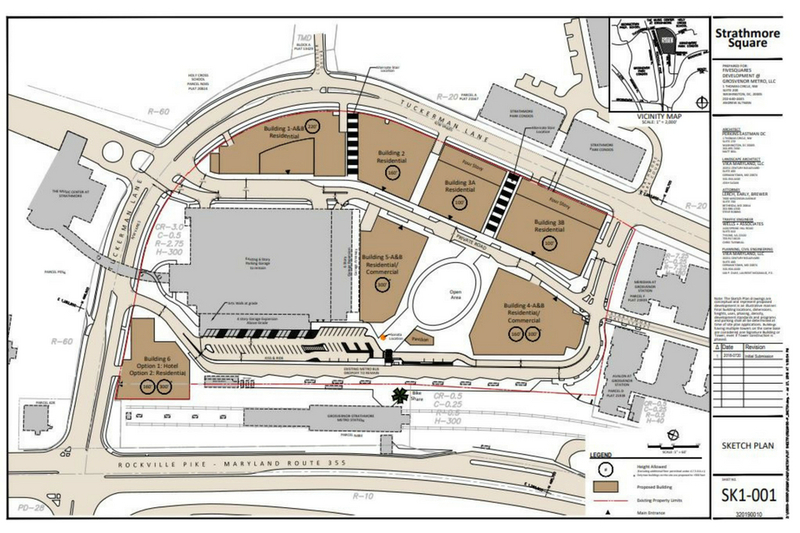 The Montgomery County Council in coming weeks will take up a draft plan for the transformation of vacant land surrounding the Grosvenor-Strathmore Metro station in North Bethesda. The proposal prepared by the Montgomery County Planning Board would permit an estimated 1,397 new housing units on the 15-acre property owned by the Metro system. A new neighborhood could rise over the next decade on the site of a surface parking lot at the Grosvenor-Strathmore Metro station in North Bethesda.